I go to Daddy’s school every year to talk about being a service dog. Actually, Mom does most of the talking. We go with Aunt JoAnne who brings her Leader Dog puppies. I’m retired now, but I still know my stuff. This year Aunt JoAnne brought Maggie May. She was “career changed” because of her hips. I think her hips look swell, but Leader Dogs for the Blind only accepts perfect dogs. She also brought her new puppy, Kaiser. He’s a German Shepherd. 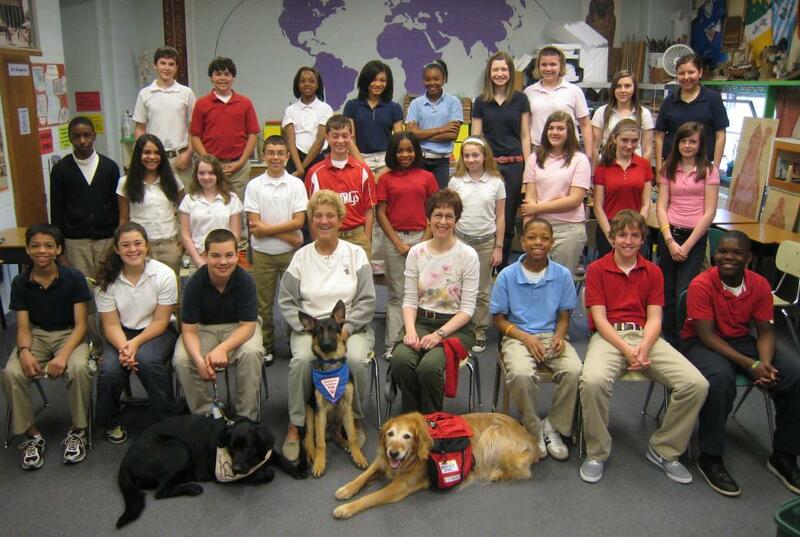 I am the yellow dog in the picture in case you didn’t recognize me in my red backpack. 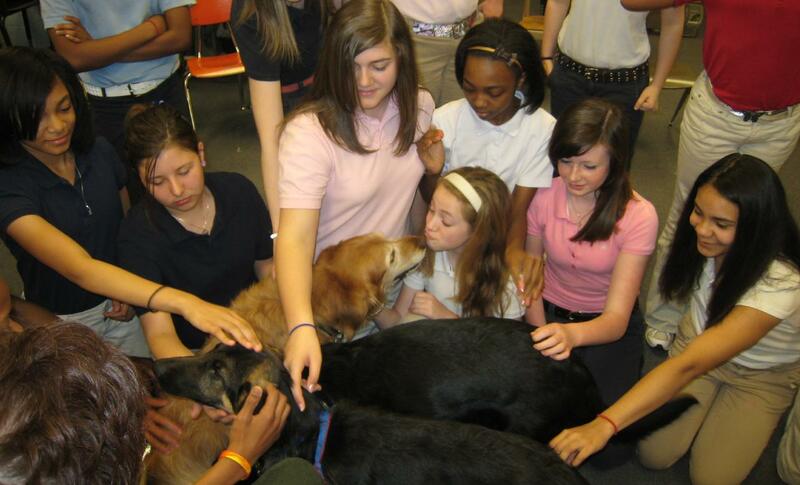 After we talked about stuff we got to receive pets and love from the students, which was my favorite part. We all remembered to be gentle and I tried to give as much of my stray fur away to the students as could stick to their clothing. Mom brushed me real good before we went, but I stil managed to leave a little bit of me behind. Yesterday was a really fun day. Today after the newsletter goes out, we’re ironing fabric for Mom’s trip to North Carolina. Then the quilt auction starts around lunch time. It’s a full day. Treats! I’ll Be On The Quilt Show! I really like these posts from Madison…dog lovers here. Thanks for all you do. .
You take a wonderful picture! and I really like the way you try to distribute your excess hair to the kids! Why should your parents be the only ones to enjoy it stuck to their clothes, furniture and car seats? I am doing the best I can to do that also. Duke the German Shepherd! I live in Berea, Ohio and take my Dad for a long walk every morning so he can come home and eat all those things I love, bacon, sausage, eggs! just what the Dr told him to stay away from! But does he listen? NOOOO! so I insist we go on two walks a day just so he won’t gain any weight! Madison, you are such a lovebug! It’s so nice of you to keep giving back to the community even though you’re retired. Madison, we didn’t know you had a “career”. How impressive to be a service dog. and your red vest is quite attractive. Of course, Molly and I feel like service dogs, too, in a way. We do our best to leave fur around so no one forgets what wonderful creatures we are. And, we are always there to love our Mom and Dad—they like that part best! Our best trick, though, is to encourage them to give us little treats. You do know that Labrador Retrievers just love to eat! On a personal note, I just have to add that Molly is continuing to improve from this vestibular syndrome thing. (she still walks wobbly but I don’t remind her of that) And, I saw my Doggie Oncologist on Thursday (six months to the day after my radiation treatments) and was told that I’m cancer free. Mom and Dad said they might have to go back to real work to pay for all of our Vet bills this year. All we can say is, “Keep up the good work!”. You are my hero! I want to be just like you. It’d be cool to be able to visit folks who aren’t feeling too good and let ’em love up on me. We’d both like that! And to visit schools too – Mom would really like being there again. We love hearing about all your adventures. We hate to go in the car and whine pitiously on any outing. You make all of us canines proud. Right now I had to wake from my nap to get mom to write this. Hobbs is busy dreaming. You are so lucky to be able to get out and distribute all that hair to an unknowing world. We don’t get out much since we’re kitties but we do like to leave lots of hair around. And if we think our Mommy needs more we just “hack” up a hair-ball. She is sooo proud of us, we can tell because she gets so excited everytime we do it!! See you in the Police Gazette! How exciting to read of your canine adventures. We are felines that dwell in the country-Tianna the Turkey has been strutting by regularly to turn our heads and make us think thats one bird to big to chase. Ben the bunny has also been visiting under the bird feeder- Ben is very fast. Your country cat friends…wh enjoy naps most of all.